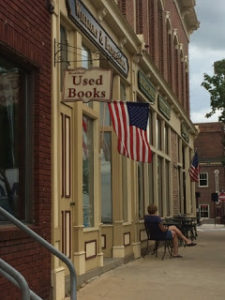 I’ve talked here before about one of my favorite chains of used bookstores in Medina County, Ohio but today we’re just talking about one location, the on off Medina’s historic Square. If you want to know more about the stores, check out this post. Now the main store in Medina city proper is probably my favorite. It’s closest to my childhood home, it is surrounded by tons of other great stores, and I know a lot of the volunteers there. So when I found out they were expanding I was stoked beyond belief. What’s even better is what they expanded. The YA section is almost 3 or 4 times the size it used to be. And let me tell you, it needed it. So many good YA books come into this location and before the expansion there wasn’t any place to put them. No more! The entire back of the main room is now dedicated to YA. Childrens and middle grade have also expanded into what used to be office space. Kids have their own room with books lining the walls and a little place to hang out and play where they can’t get into any trouble while their parents shop. The other back room which used to be over flow is now dedicated to mass market paperbacks. They line the walls from floor to ceiling with plenty of room for more. Fantasy and sci fi have taken over the endcap bookcases on one side while classics, essays and plays take over the other side. Non fiction remains in the middle and hardcover and trade paperback fiction have merged to line the surrounding walls. I love this store and the people who make it work. The volunteers, the few paid staff, they do such good work. The things they have done with this store in particular are just amazing and I can’t wait to see what they do next. If you’re in the Medina/ Akron area this is a places you need to check out, along with its sister stores in Brunswick and Wadsworth. What’s your favorite used bookstore? Share in the comments.